There were some unquestionable highs for the Lakeridge girls basketball team at this year's Nike Interstate Shootout tournament. There were a couple "other" games, too. In total, the Pacers went 2-2 at the tournament — held Dec. 26-29 at Lake Oswego High School — learned a lot about their abilities and a lot about where their team still needs to grow. "I think one thing we've been constantly talking about this tournament and we need to start implementing is that, just from the get-go, being ready to play," said Lakeridge senior Brooke Clinton. "I think one of the things we need to work on is we start to deliver in the third and fourth quarters when it's too late. I think if we start getting on it right from the beginning, I think that we have a chance to prove ourselves and show what we're made of." 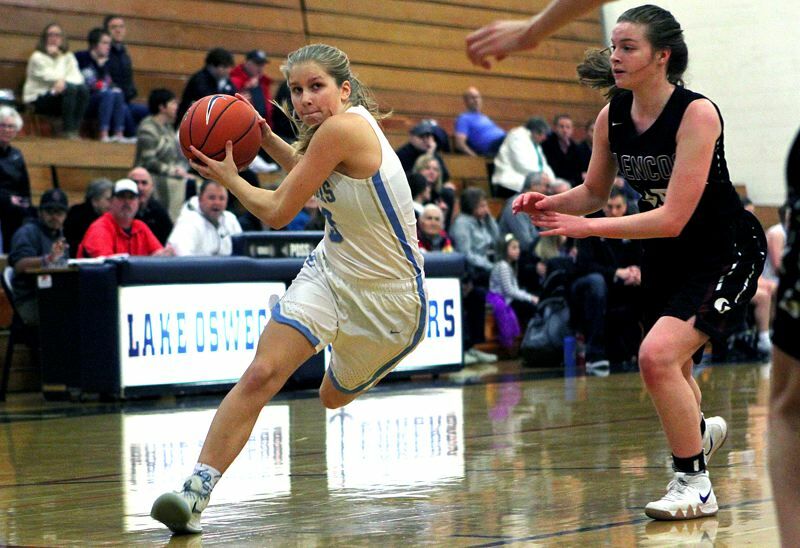 "For league play, I feel like we can definitely be a really good and fast-paced team, but we are young," said Lakeridge sophomore guard Rose Daniels. "There's a lot of sophomores on our team which might make it kind of iffy for this season, but for next year and the seasons after, I know that we're definitely going to be really good because we've been playing together for a while." Lakeridge opened the Shootout with a 52-49 win over Glencoe on Dec. 26, fell to St. Mary's 54-41 on Dec. 27, dropped a 66-30 decision to Westview on Dec. 28 and rolled past Lake Oswego 57-35 on Dec. 29. With those results, the Pacers' season record moved to 5-4 overall. The Lakeridge and Glencoe girls basketball teams took turns grabbing momentum until the very end of the game in their tournament opener. There, after Glencoe had erased almost all of the Pacers' 10-point fourth-quarter lead, the Crimson Tide cut its deficit to just three. After inbounding with just seven seconds to go, Glencoe swung the ball to senior guard Breauna Van Dyke just right of the top of the key. She caught the ball and launched a game-tying 3-point attempt just as the final buzzer sounded. Her shot dropped through the hoop, but game officials ruled that time had elapsed before Van Dyke released the ball and the Pacers escaped with a 52-49 victory. "We definitely have to play smarter and slow it down when the game is starting to get tight," said Daniels, who finished with 11 points, seven of those in the second half. "We need to slow it down and make smarter passes and take better shots." For the game, Reardon, Daniels and freshman guard Reese Ericson led Lakeridge with 11 points each, Clinton added nine and freshman post Kiersten Weiler had eight. For Glencoe, junior guard Mallory Confer led all scorers with 16 points — 14 of them in the second half — senior guard Morgan DeBord added nine and Van Dyke had seven. The Pacers hung with Three Rivers League foe St. Mary's for one quarter of their matchup, but saw the Blues take over in the second period. St. Mary's got six points each from senior Cali Rawhouser-Mylet (on two 3-pointers) and freshman Abby Graham, outscored Lakeridge 22-10 in the frame and carried a 34-19 edge into the half. The Pacers — led by Ericson's 13 points and another from 12 Reardon — held their own in the second half, outscoring St. Mary's 22-21 in the game's final 16 minutes, but never managed to overcomes the Blues' big second quarter. In addition to Ericson and Reardon's efforts, Daniels was the team's next-highest scorer with five points. For St. Mary's, junior Marley Johnson led all scorers with 24 points, Graham had seven, and Rawhouser-Mylet and Anna Eddy six each. The Pacers ran into an absolute buzzsaw in Westview on the third day of the Shootout, with the Wildcats racing out to an 18-2 first-quarter lead, extending that margin to 34-7 at the half and coasting home from there. "Honestly, props to them, but if we had just settled down in the beginning, made good passes and saw the gaps in their defense and the pressure, I think we could have done a lot better," said Clinton, who finished with eight points. "As a team, we're just aiming to come out swinging and going hard right off the bat," added Ericson, who finished with nine points, seven in the second half. While the Wildcats continued to hold the upper hand in the second half, the Pacers were much more competitive, with Westview posting a 17-10 edge in the third quarter and Lakeridge a 15-13 advantage in the fourth. "Once we did settle down, things started going more our away and we started getting more buckets," Clinton added. "Now … one of the main things we really needed to improve on (is) making good passes and breaking through their pressure." For Westview, sophomore Afton Keeney led the way with 16 points, senior Nicole Fleenaugh added 14 and junior Danielle Llamas 12. That set up a Day 4 matchup against crosstown rival and tournament host Lake Oswego, and the Pacers proved they were ready. Lakeridge dropped a 21-8 first-quarter bomb on the Lakers, almost duplicated it in a 16-5 second period and sped into the half with a commanding 37-13 lead. Clinton was hot early, scoring seven points in the first quarter and 11 in the half on her way to a team-high 15, while Ericson and Reardon both hit first-quarter 3-pointers. Seniors Taylor Anders and Katy Gilbert tried to keep the Lakers close with four points each in the first, but on this day, it just wasn't enough. Ericson's five points and Clinton's four led the way in the second period while the Pacer "D" shut LO down big-time. For the game, Ericson added 14 in the win and Daniels seven. For Lake Oswego, junior Megan Woolard knocked down two "3s" and scored seven points in the third quarter, while Gilbert broke free for a huge fourth period, draining three 3-pointers and scoring 11 of her game-high 17 points.